A Vortex in GTA San Andreas. The Vortex is a hovercraft in Grand Theft Auto: San Andreas. 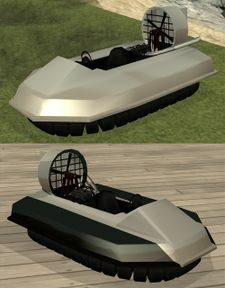 The Vortex is a single-seater drivable hovercraft, capable of moving on land and water, and glide short distances. Steering is difficult because it has a fan with a rudder rather than wheels or a rudder in the water, thus having no contract to the ground or water and no grip. It is possible to glide the Vortex for a short period of time if the player sends the vehicle flaying off of a high location, and has a good driving skill. If it is abandoned in the water it will sink. If it sustains too much damage or is shot too many times, despite its small size, it will also explode quite violently, similar to an aircraft explosion. It is also used for two tests in Boat School, which can be accessed in Bayside Marina. The two special Vortex's from "Cut Throat Business"; the white Vortex is driven by the player and Madd Dogg, while the black-and-white Vortex is driven by OG Loc. Three Vortexs' with unique color schemes can be found during "Cut Throat Business". Two of them, which are used by the player and Madd Dogg to chase OG Loc, are all-white, while the third Vortex driven by OG Loc is black with a white stripe. The player can only store any Vortex's in a garage by failing the mission, as the chase eventually switches to a Kart chase at a pier, forcing the player to abandon the hovercrafts. In addition, while it is possible for the player to use any of the hovercrafts to chase OG Loc while he is on a Kart, the player will ultimately lose the vehicle upon completion of the mission. The white Vortex is more easily attainable, requiring the player simply ignore the instruction to chase OG Loc at any point of the hovercraft chase, failing the mission and gaining full control of the vehicle. 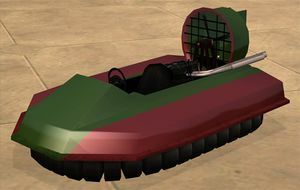 OG Loc's hovercraft is attainable after he ditches the vehicle at the pier, and also requires the player cease to pursue him and fail the mission. Another method involves simply having to kill Madd Dogg in the beginning of the pursuit before OG Loc is out of sight to gain access to any one of the three hovercrafts. According to the game's files, the Vortex is considered an aircraft rather than a boat or a car. Because of this, the player will get attacked by SAM missiles for driving it near Area 69 or the Easter Basin Naval Station, and Hydras will attempt to shoot the player down at a four-star wanted level. Additionally, regular Police Mavericks will not shoot the player. And as mentioned before, once it takes enough damage it will explode in multiple successions, like an aircraft. Furthermore, if the player does destroy a Vortex by attacking it enough times to cause it to explode, they also receive a two-star wanted level, like with aircraft. Despite the fact that the Vortex lacks a horn, pedestrians will still react when the player presses the horn button (H on PC, left stick button on Xbox and PS2). A Vortex can be seen falling down a slope near Bayside, which some people believe to a ghost vehicle. This is caused by the Vortex being spawned on a slope. On a small beach in Tierra Robada, under entrance to Bayside Tunnel (will roll down the hill for a short time, and come to a halt in the water. This is referred to as the "Ghost Vortex". See The Myths Section for details). Inside the aircraft carrier in Easter Basin Naval Station, San Fierro. WARNING: Entering this area will trigger a five-star wanted level! Available at Easter Basin docks for importing after third list completion for $20,800 on Sunday. Bovver '64, GTA Vice City Stories equivalent. This page was last modified on 13 January 2015, at 02:28.